Don't miss Iain Sinclair and Patrick Wright who will be speaking at this event at Cafe Oto on Tuesday 24 March. You'll find all the details here. A limited first edition of Winstan Whitter's film "Save Our Heritage" will be available in DVD format. Entry is free. But bring some cash because The Broadway Bookshop will also be selling copies of "Hackney, That Rose-Red Empire: A Confidential Report" and "A Journey Through Ruins: The Last Days of London". Don't miss this OPEN event on Tuesday 24th March when Iain Sinclair and Patrick Wright will read from, and talk about, their work. A film from Iain Sinclair's archive, called “Diary Film: Hackney 1969”, will also be screened. The event begins at 7.30pm at the Cafe Oto, Ashwin Street, Dalston. E8.More details here. Cafe Oto has limited capacity, the last event was packed, so come early to avoid disappointment. Admission is free but the event is an OPEN fundraiser (see below) so please give generously. A Journey Through Ruins (1991) has now been republished with a new introduction by Patrick Wright entitled Going Back to Dalston (2008). The Star Bakery was evicted after the auctions, on the grounds of redevelopment, but has since been left on death row. The Council recently demolished three of the Georgian houses as part of its "conservation led regeneration project". Former Dalston resident, Patrick Wright<, is a writer and broadcaster with a particular interest in the cultural and political dimensions of contemporary history. He is a Fellow of the London Consortium and the author of many books including On Living in an Old Country, Tank, The Village that Died for England, Iron Curtain and A Journey Through Ruins. 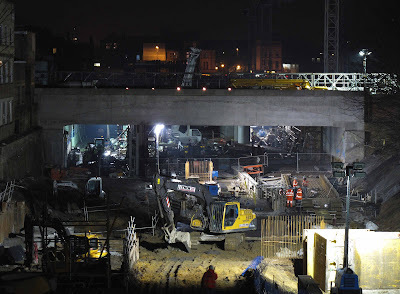 Mike Wells' photo of The Slab being constructed above Dalston Junction's railway cutting to provide an Olympic bus-turnaround. There will be towers of flats for private sale, of up to 20 storeys, intended to pay the £40million for The Slab. Now there's talk of a government bailout. But the blocks were never designed for affordable family housing. "Sinclair carried out the poetic realignment of London that would eventually earn him notoriety as the occultist surveyor who had recharted the city..." Patrick Wright in 1991. In this latest film Iain Sinclair describes Dalston and Hackney as it was and as it has become. Funds raised at this event will contribute to OPEN's community consultation programme - a series of events responding to the newly published Council Masterplan for Dalston. We reproduce here an article written by Michael Rosen outlining an alternative transport option for linking Dalston and Hackney with the rest of London. This article does not necessarily reflect OPEN's views. "As we ponder the state-subsidized vandalism and hijacking of publicly owned space that is Dalston, we might just take time out to think of what might have happened if the core question at the heart of this whole fiasco had been looked at it in an open and rational way. Remember, the rationale behind the building of buy-to-rent tower-blocks in the heart of Dalston, is that they were needed to help pay for the whole scheme. But what is the idea behind all this? That Hackney would have a new bus/rail “Transport Interchange” and a Tube line too. Well, it now turns out that what we’re getting isn’t the Tube but an Overground service. And we’ve got Overground services in Hackney anyway. 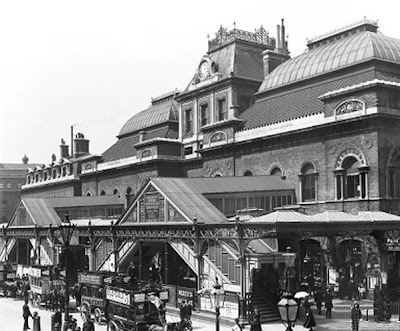 I’ll try and lay aside the history of how Dalston's rail link to the City, the Broad Street line connection, got closed. People will remember that we were told at the time that this was because the line wasn’t sufficiently used. 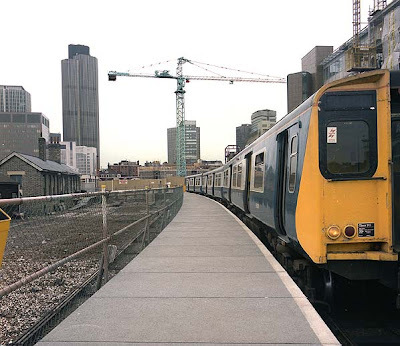 So in contradiction of every report coming out of every city in the world, Hackney and British Rail allowed a rapid transit rail system to close. 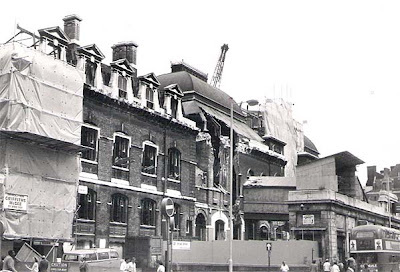 Broad Street station undergoing demolition in 1986 to make way for the Broadgate development. It was in fact everything to do with the demands of what OPEN is calling ‘Mammon’. They wanted the Broadgate Centre and if cheap, reliable, clean public transport had to be destroyed to enable it to happen, then so be it. Vandals. OK. I couldn’t leave it to one side. It still hurts. But, as we know, the bed for the railway was left in place. Now, at this point, you might have thought that Hackney and anyone else concerned would have looked at what other cities all over the world are doing. In such confined spaces, and over similarly limited distances, cities are rediscovering the tram. 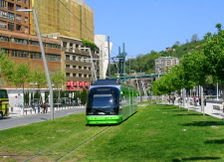 Rather than trying to use the technology of 1000 mile rail systems for twenty mile circuits, cities have discovered that for much lower cost of installation and running, along with a much more eco-friendly system, the modern tram offers a much better solution. What’s more our disused railway infrastructure offered what few cities can ever get – a designated trackway. 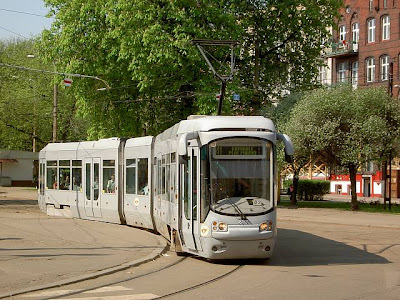 The trams wouldn’t have to compete with the traffic, as you see in many other cities across the world. What’s more, the intrusion of the Broadgate development could have been partially mitigated, by letting the trams come up on to the highway (where admittedly they would have competed with traffic) to reach Liverpool Street station and the tube network. The new Hackney rail system will take us to Bishopsgate/Shoreditch (a sort of transport no-man’s land) and then veer eastwards to connect with the tube network at Whitechapel and then continue much further south to connect with the Jubilee. It will also become apparent that the North London Overground line does not interconnect with this new line unless people want to get out at Dalston Kingsland, walk a few hundred metres (not great in winter) to connect with Dalston Junction. Perhaps a foot tunnel is being built. Perhaps not. Instead we have the worst of all worlds. We have a high cost rail system that required massive capitalisation. In turn this turned Dalston into a ‘development opportunity’ which would have been laughable before the debt-fuelled boom and looks like proving to be just as laughable after it. We have housing that does not address Hackney’s needs of the moment and may well turn out to make it worse by sticking families in tower blocks. - above ground, Transport for London is creating a traffic hellhole of the future by creating a right hand turn across the traffic flow of Kingsland Road by building a bus station on top of the new Dalston Junction station. Stratford’s bus station (often thought to be a model for modern bus stations and terminuses) is fed by a one-way traffic system. Others such as Finsbury Park, or Muswell Hill, work on an orbital system. Dalston will be the worst kind. " Readers of this blog will recall that when Michael Rosen suggested reintroducing trams Hackney's Mayor Pipe responded by saying "Sadly for Mr Rosen and his fellow travellers it's going to take a lot more than a lick of paint and a few trolley buses to achieve economic transformation". Mayor Pipe then sought to smear Michael Rosen by accusing him of of wanting to "keep Hackney crap". The GLA have just announced further investment in the East London line to create a London Orbital rail route. OPEN wishes to acknowledge the use of railway photos from the wonderful site Subterranea Brittannica.